Input text: a [marble] statue is on a 1st .5 foot tall and 2 foot wide and 2 foot deep [marble] cube. a [marble] woman is -1.2 foot behind and -5.8 feet above the statue. a 1st 1 foot wide wood bowl is -.5 foot to the right of and -.2 foot above the woman. a 2nd 1 foot wide wood cereal bowl is -.5 foot to the left of and -.4 foot above the woman. a 1st [marble] tombstone is on a 2nd [marble] 1 foot tall and 2.5 foot wide and 2.5 foot deep cube. the 2nd cube is 3 feet behind and 3 feet to the right of the 1st cube. a 2nd [marble] tombstone is on a 3rd [marble] 1 foot tall and 2 foot wide and 2 foot deep [marble] cube. the 3rd cube is on a 4th .5 foot tall and 2.5 foot wide and 2.5 foot deep [marble] cube. the 4th cube is 4 feet behind the 2nd cube. a large [moss] wall is 12 feet behind the first cube. the ground is 50 foot wide [moss]. it is night. the camera light is dim green. a 12 foot tall tree is -1 feet behind the 1st cube. 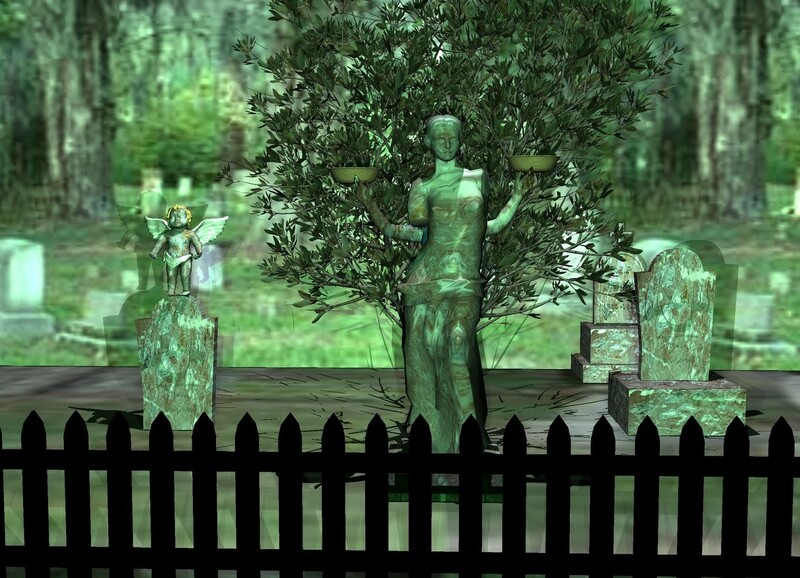 2 malachite green lights are 20 feet in front of and above the statue. a ghost white light is 10 feet above the statue. a 2 foot tall and 20 foot wide black fence is 5 feet in front of the statue. a 3rd [marble] tombstone is 4 feet to the left of and 3 feet behind the first cube. a 2 foot tall [marble] angel is on the tombstone. a blue gray light is 10 feet in front of and -3 feet above the statue. a black light is behind the tree.